What Are the Dangers of Exercising With a PICC Line? 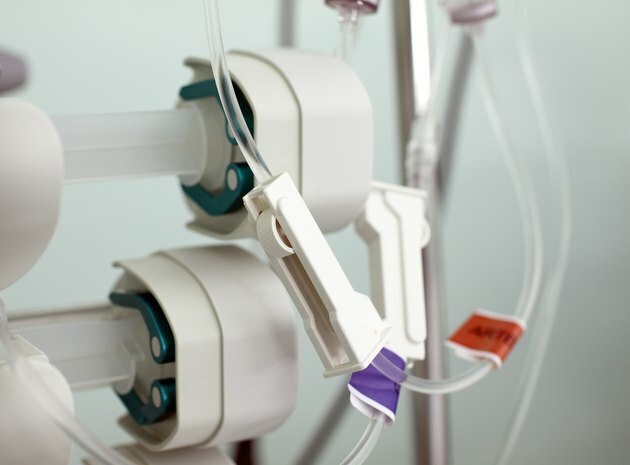 A Peripherally Inserted Central Catheter is a flexible tube that is inserted into a patient's arm above the elbow to facilitate the delivery of medication and blood draws. It is about 18 to 24 inches long and is preferred because it can remain in place over longer periods of time than midline catheters and intravenous lines. Another advantage of PICC lines is that they can usually be maintained at home. However, there are still precautions that you should take when exercising to avoid getting an infection or displacing the PICC line. These are serious dangers to your PICC line that should not be taken lightly. An infection is a dangerous PICC line complication; infected PICC lines must be removed and replaced. Often, patients are also required to take antibiotics to clear the infection. Getting your PICC line wet increases the chances of infection. Therefore, exercises like swimming must be avoided wen you have a PICC line. You should also try and keep sweat away from your PICC line when exercising. PICC lines are sutured into place to avoid movement or shifting of the line. However, high impact and strenuous movements can still dislodge the PICC line out of place. There is also a danger of breaking the PICC line. Therefore, you should avoid weightlifting and contact sports as these require strenuous movement of the arms and may involve collisions. Moderate exercise that does not involve a lot of upper body movement or lifting of heavy objects poses no harm to your PICC line. In fact, it can help prevent complications like clotting that become more prevalent when you are sedentary. As long as you do not have an underlying medical condition that makes exercise dangerous for you, moderate exercise like walking poses no danger. PICC lines are designed to give you this independence. You must care for you PICC line well to avoid infection. This includes keeping it dry at all times. Wrap it in a gauze or plastic wrap before showering and keep it clear of sweat. If you see it is soiled, change the dressing immediately, following the instructions given to you by your health care team. Always wash your hands thoroughly before touching the PICC line.